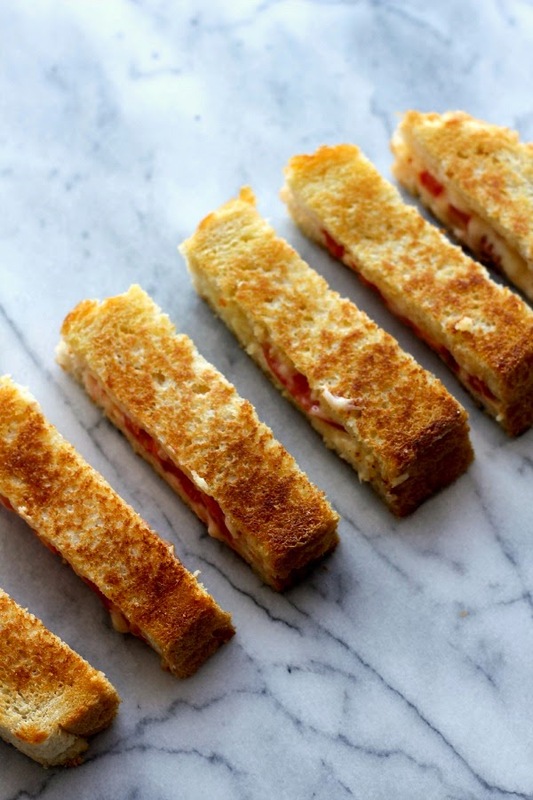 Kick your grilled cheese up a notch with smoky bacon cheddar cheese and fresh, juicy tomatoes. These dippers make the perfect afternoon snack for both kids and adults! When my kids come home from school they are always hungry! Lunchtime is early at school and I feel like they never quite get enough to eat. Not like when they are at home and can have bigger meals and snack more often, like on the weekends. I'm always looking for new snacks to give the kids. Something healthy but delicious. And quick and easy to make, too. 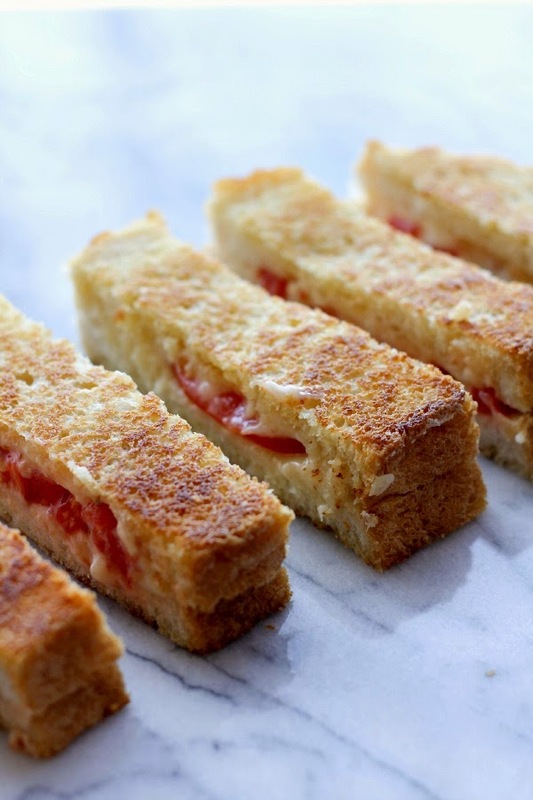 These Smoky Bacon Grilled Cheese Dippers fit the bill! Three ingredients, a few minutes to grill, and you've got a cheesy, gooey, scrumptious snack that the whole family will love. The smoky bacon cheddar cheese is rich and creamy and has bits of bacon throughout. I love to eat just little slices of the cheese as a snack! It comes in a block and can be found in the deli section of your local grocery store, in the area where they keep the imported and fancy cheeses. I love to buy local, so look for that first if it's available. Although these dippers are a great snack, they are awesome for lunch too! My oldest and I each had six dippers along with some fresh veggies and it was the perfect amount for lunch. Dipping your dippers in tomato soup is also encouraged! Heat a 12-inch skillet over medium-low heat. Add a tablespoon of butter to the pan to melt. 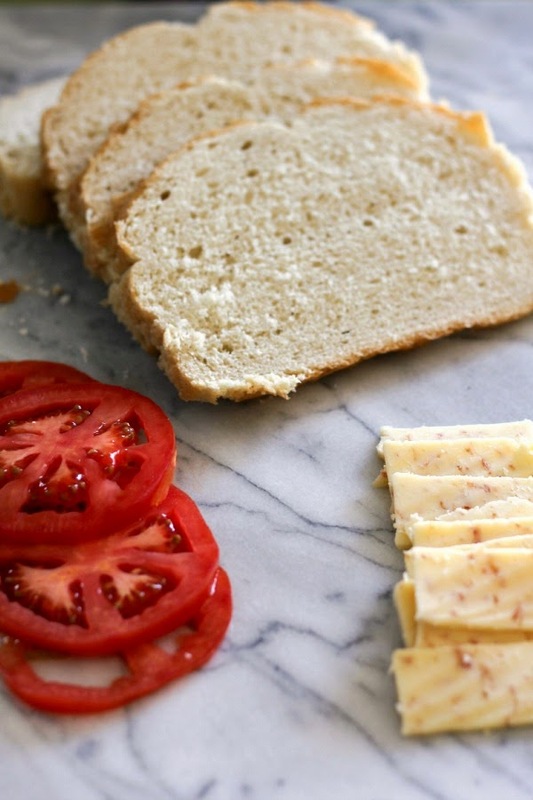 Lay the four slices of bread on a board or plate and spread some softened butter on one side of each piece. Lay one slice of bread in the hot skillet, butter side down. 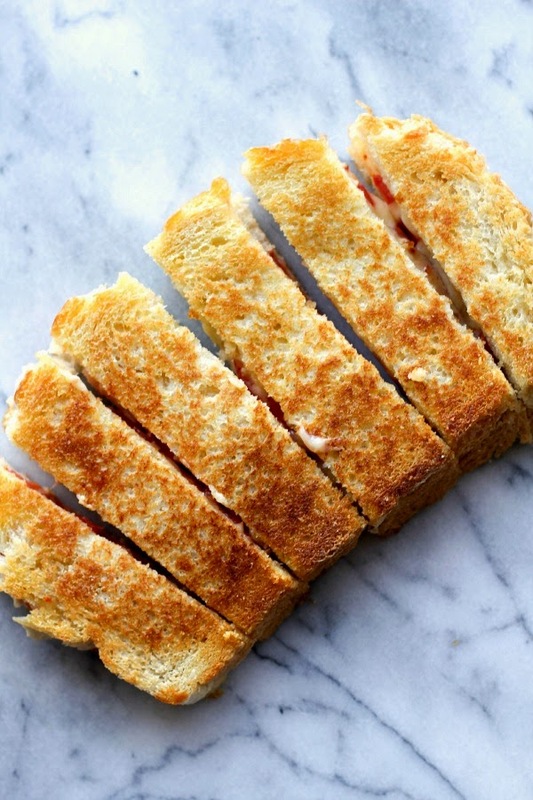 Lay six slices of cheese on the bread, then two tomato slices. Sprinkle with salt and pepper, then lay another slice of bread on top, butter side up. Cook until brown and the cheese is melted, then flip the sandwich over and cook until the second side is browned. Repeat the process with the second sandwich. Allow the sandwiches to cool and set for just a few minutes. Cut each sandwich in half, then cut the halves into thirds. Serve the dippers as is, or with some tomato soup. I'm excited to continue my partnership with the United Dairy Industry of Michigan in 2015 and I thank them for sponsoring this post! I was compensated for developing a "Super Snacks that Pack a Protein Punch” recipe using Michigan dairy products. As always, all opinions are my own. UDIM is the umbrella organization for the American Dairy Association and Dairy Council of Michigan. Their goal is to promote Michigan’s locally produced dairy products and reconnect consumers with the people behind their food. For more great dairy recipes, follow UDIM, branded as Milk Means More, on Pinterest. To learn more about nutrition, animal care/well-being and on-farm practices related to dairy products and the dairy industry, you may want to follow Milk Means More on Facebook. You can also follow them on Instagram, Twitter and YouTube!